Aubrey de Grey, SENS Foundation, on lifelong health, regenerative medicine. How Would Lifelong Perfect Health Change Our Society? Photograph by Bruce Klein and Susan Fonseca-Klein/Wikimedia Commons. “I do not like to use the word immortality. It gives a very bad, a wrong impression about my work. I work on health. I am interested in ensuring that people will stay completely youthful, like young adults, for as long as they live,” he said at a press conference at Ciudad de las Ideas, an annual conference about big ideas held in Puebla, Mexico, and sponsored by Grupo Salinas, this weekend. de Grey is the founder of the SENS Foundation, a nonprofit that, among other things, is funding projects intended to cure aging, if not dying. His goal: that everyone may stay a health 29 for as long as they may live. “It is quite likely that there will be a big side effect of doing that, which is that people will live a lot longer, but that is just a side effect,” he says. Let’s say that de Grey’s research pans out—whether it’s in the next 20 years, as he hopes may be possible; in the next 40, which he thinks is likely; or not for the next 100, which could happen “if we are unlucky or if we do not try hard enough.” How would lifelong health change the way we live? When I asked de Grey that, he cautioned that he is not a sociologist, economist, or theologian, and said that he sometimes speaks to those groups to encourage them to start thinking now about the ramifications of such a medical breakthrough. That caveat out of the way, he believes that one result would be that adult children will no longer have to care for their elderly parents—which would allow them to be more productive in the workforce, for instance. “I think that actually society will be very different but … mostly in ways that it is already moving as a result of technology, including health technologies, that are happening already,” he says. “We see today many more people having multiple careers, moving from one to another; having multiple long-term partnerships one after another; generally much more equality between ages; people having partners that are very far distance from them in age. These things I think will simply continue to progress.” Furthermore, he imagines, women would be able to postpone childbirth still further—which could ameliorate a common concern, that the population would explode as a result of death-defying research, he believes. OK, so de Grey isn’t doing hard science himself. His theories may all prove wrong when tested. And in any case, I’m sure I’ll be long gone before anyone cures old age. But who says an enthusiast can’t contribute? 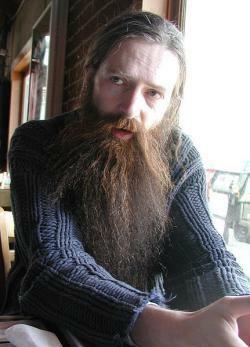 If someone, someday, gets to live a lot longer than we will because Aubrey de Grey brought more buzz to the A-word [aging], it doesn’t matter if he grows his beard to his knees. de Grey may agree with that. “We need to try harder, we need more efforts on the part of biologists and technologists to make this happen as soon as possible,” he said To that end, he said on stage at Ciudad de las Ideas, his SENS Foundation is funding two regenerative-medicine projects at the lab of Anthony Atala, who spoke at Ciudad de las Ideas on Friday. (Indeed, Atala is on the research advisory board of SENS.) Maybe we can’t all stay 29 forever, but his work is at least enabling researchers to try harder.